The Hirshhorn celebrated its 40th anniversary by renovating the third floor galleries. The first exhibition in the new space, At the Hub of Things: New Views of the Collection brings together pieces from the museum’s collection spanning themes, generations, and media. A new iteration of Lawrence Weiner’s A Rubber Ball Thrown on the Sea, produced and installed by OEC, graces the curved walls of the space. Kate Fleming, one of the Exhibits Specialists who worked on the project, explained how the seven words in Weiner’s conceptual piece were applied to the gallery wall. We test painted on our own wall at OEC. The bowed walls of the Hirshhorn created an optical allusion – skewing the way the words appeared as they wrapped around the curves. To combat this issue, the team used a digital level to place the friskets at a 22.5° angle. 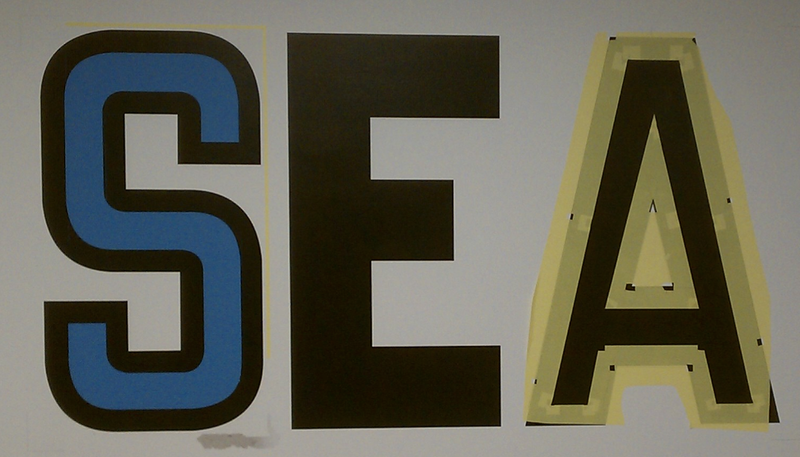 This precise placement ensured that the words could be viewed the same way from multiple locations in the room. The first step was to back paint the frisket with the wall color. This helped adhere the frisket to the wall and prevented color bleed. Then the first frisket was used to paint the outline in a highly pigmented, high gloss black paint. (As seen in the letter E above.) To achieve a streak-free lustrous finish the OEC team used a minimum of three coats of black. 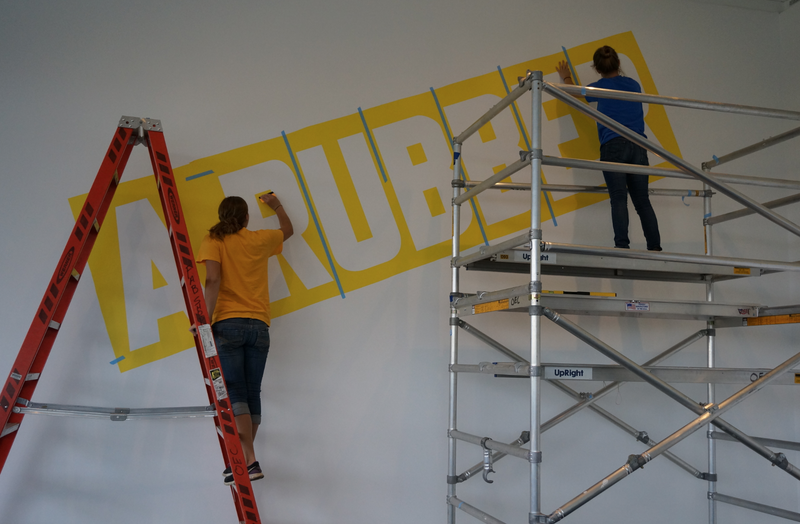 Erica Querns, on ladder, and Kate Fleming, on scaffolding, apply a frisket to the gallery wall. After the vinyl was removed, the team made few touch ups to the paint and the finished work was complete. The crisp, clean lines of this piece are on view in the Abram Lerner Room on the third floor of the Hirshhorn Museum and Sculpture Garden.